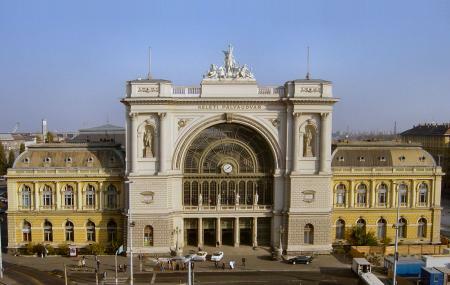 Find hotel near Budapest Keleti Railway S ..
Keleti Railway Station is almost like the lifeline of Budapest as it is the main international station as well as the main intercity station of Budapest. The architecture of the place represents what the definition of modernity was when the initial main stations of Budapest were being built. This station was made between the year 1881-1884 and was one of the main terminals of Europe even during that era. Karoly Lotz has gifted this place with various mindblowing frescoes that adorn the inside walls of the station. The facade outside has statues of James Watt and George Stephenson- both of whom hold prominent places in history. Train schedule differs. Check the official website for train schedule. How popular is Budapest Keleti Railway Station? People normally club together Parisi Udvar and Budapest Opera House Or State Opera House while planning their visit to Budapest Keleti Railway Station. Central railway station with good connection to subway. Good connectivity and a beautiful architectural marvel. Taking the Metro here, most likely line M2, will take you to Budapest's major touristic attractions. Tickets cost 350 forint, less than 2 dollars, and can be bought with credit card from the purple machines easily. Great location for a Budapest stay. Convenient for Metro or take a leisurely stroll into the centre. McDonald's nearby as well as some tasty restaurants. Spar shop has all you need for brews and a snack.